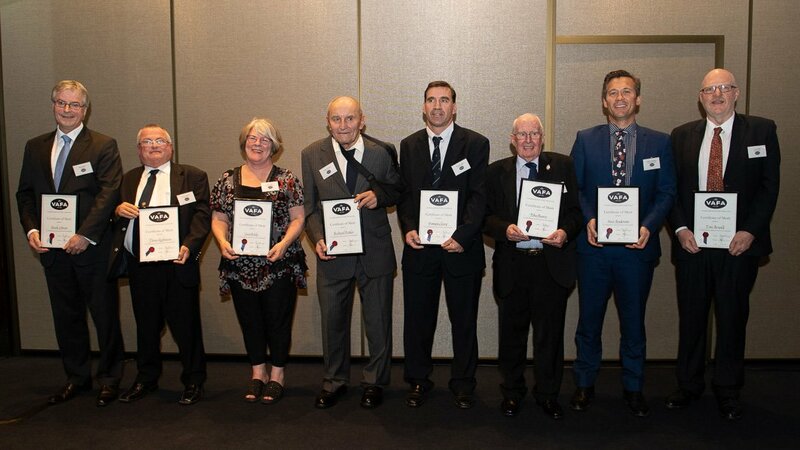 At Monday’s VAFA Season Launch held at the MCG, Steve Anderson was one of eight people to receive a VAFA Certificate of Merit. The Anderson name is synonymous with the Hampton Rovers Football Club, and one of the most recent examples is Steve Anderson. Steve joined the club as a junior in 1982 and has since played 475 games for the green and gold, including 329 senior matches. As a junior he assisted the committee by marking the ground, operating the scoreboard and cleaning the clubrooms before acting as a reserve goal umpire, timekeeper, boundary umpire, coach and team manager for the juniors. He’s been named Best Junior Club Person, served as senior club President, been awarded Life Membership of the Hampton Rovers and is currently Chairman of the Board. Steve is the 15th Hampton Rovers representative to receive a Certificate of Merit, joining Norm James, Bruce De Lacy, Bob Cave, Bob Coldrey, Fred Coldrey, Gordon McGregor, Sue Anderson, Don Scarlett, Peter Wolfe, Max Grimmer, Ian Cave, Tony Naumoff, Cameron Voss and Jason Cave.